Bluefire Lady- 1980 Appaloosa mare.
" 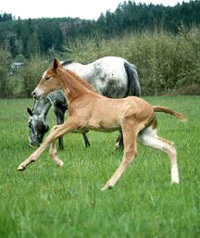 Abby" has 8 registered foals. She is 7 for 8 on color. 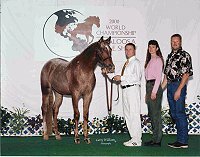 Her first colt, Okie Doc was and continues to be shown on the open jumping and Appaloosa circuit. He stands 17+hh and is a lovely hunter. She has been a wonderful producer for years and is now retired on our farm. Her foals include Miss Okie Doc, Shesa Okie Too, Hide the Glitter, Shy Marshall, No Trespassing, She Trespasses and In Full Dress Blues. You can contact Rick & Toni Petersen! in whole or in part, is a violation of Federal Law. Webdesign by KJB Designs.